With the month-long gap between sets of high-level nuclear talks and facing tension over new subsidy cuts, President Rouhani yielded the public stage to the tough talk of the Supreme Leader and Iran’s military this week. Using the 34th anniversary of the failed US attempt to rescue American hostages from the Embassy in Tehran, Ayatollah Khamenei and his commanders sniped at Washington’s weakness. The Supreme Leader said, “The U.S. got hit in the head but still hasn’t learned anything”, while the military promised a “crushing response” to “continued enmity”. 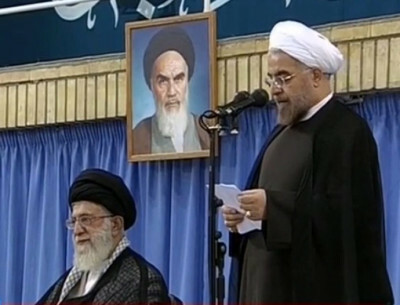 Tehran Friday Prayer leader Ahmad Khatami linked the anniversary to the nuclear negotiations — due to resume in Vienna in mid-May — advising the Government that it should answer President Obama’s “nonsense” with “a firm strike at his mouth”. We have unfortunately witnessed many attempts in the past three decades to establish a secular government and permeate its values in society….We must be vigilant so it is not permeated in society the slogan of religion’s separation from politics. Instead of responding, Rouhani’s attention was on the economic front. As part of the second phase of subsidy cuts, the Government raised prices on gasoline by up to 75%. So far, public dissent has been muted, as Rouhani and his Ministers promise that any rise in inflation will be limited. They await the outcome of another test: can they restrict support payments, covering the increase in prices, to the less well-off? The tough talk will not halt the forthcoming talks, as the Supreme Leader still supports the nuclear negotiations. The Government continues to put out positive signals, such as the re-design of the Arak heavy-water reactor and the conversion of 20% uranium stock, while maintaining a firm line on its right to enrich fuel up to 5% and maintenance and development of its current 19,000 centrifuges. However, the statements continue to box in the Rouhani Government on the domestic front. Political and cultural initiatives are now suspended, especially with the testing of the first stages of the Rouhani economic program. Beyond the headlines, there are some less-publicized but significant initiatives. The Government continues to signal that it wants rapprochement with Gulf States, including Saudi Arabia — former President Hashemi Rafsanjani, the leading channel to Riyadh, hosted the Saudi Ambassador last Monday. Will Rising Gasoline Prices Disrupt Economy & The Country?